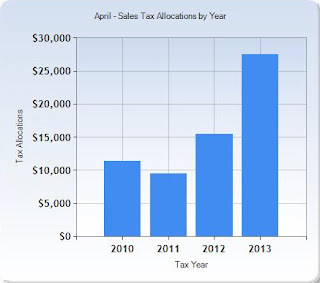 VON ORMY — Von Ormy had another month of unprecedented economic growth as indicated by an increase of over 60% in sales tax revenue received this April over last year. This is the third straight month of such increases. The success of all the communities in the I-35 South Corridor (San Antonio to Laredo) is dependent, in many respects, on the flow of traffic through the corridor, and the interaction of that flow with the communities themselves. In 2009, an average of 25,000 cars and trucks moved along I-35 through the South Corridor every day. Von Ormy experienced traffic counts over 40,000 in 2009, due to its inter-connection with the 1604 corridor. That number is even higher today. For communities along I-35 in the Eagle Ford Shale play this traffic flow provides tremendous opportunities in terms of sales tax revenues generated by restaurants, hotels and motels, retail outlets and gas stations. However, according to UTSA's I-35 South Corridor study, only a few communities in the corridor have been able to successfully capture this traffic flow. Von Ormy has been the vanguard of strengthening its assets to increase competitiveness and the result in 2013 are plainly evident. Sales tax figures for April (paid to the city in April, but collected the month prior) are up over 60% over the preceding year. This was accomplished through the city's decision to emphasize its assets of being a new city. Minimal bureaucracy, zero cost permitting, falling tax rates and the city's "can do" attitude have attracted several new businesses, including a Pilot Travel Center, Subway and Cinnabon. Travel demand models for forecasting freight and passenger vehicle flows indicate that rail, truck and passenger vehicle traffic in the corridor will likely increase in the foreseeable future. This means that additional facilities for trucks, travelers and freight will be needed. To take full advantage of this traffic moving through I-35 in the South Corridor, Von Ormy has focused on its frontage property bordering I-35. The city is presently holding public hearings on a new comprehensive land use plan that will identify commercial, retail and industrial facilities in close proximity to the highway. The purpose is to create a more attractive gateway connection linking the community to I-35. Mayor Martinez de Vara said, "By carefully developing our frontage roads, Von Ormy will draw in more investment. Much of this new investment will be directed toward the construction of commercial facilities like restaurants and hotels, retail shops and light industrial parks." The Mayor added, "If our city is to take full advantage of the present opportunities and our unique location, we must concentrate on strengthening our current assets and building new ones to improve our competitiveness. In this unprecedented race for I-35 corridor development city's require strong leadership with a vision for regional development and the ability to creatively utilize their current community assets to create new ones." The Mayor said he will be working with Council and Staff to develop Phase II of an I-35 corridor plan. Phase I included street lighting and parking restrictions.